Daily we hear of wars and rumours of wars. Peace on earth and goodwill toward men are now further off than ever. All the machinery for peace we have created during the last two decades has not brought about the desired result. The League of Nations, the Briand-Kellogg pact, the Locarno pact, and what not, are powerless against any armed aggressor nation which is determined to break the peace. This only shows the futility of establishing any machinery for peace without the will for peace. On the surface, if we are to judge from the public utterances of statesmen all over the world, it seems that peace, and only peace, is the object of their policy. But their actions belie their words. Sabre rattling, competition in armaments, defensive and offensive alliances are the order of the day. Look where we will, we see everywhere a determined preparation for war. As between nations, suspicion, not understanding, is the rule. Suspicion begets hostility, and instead of Astraea, Mars reigns. In the nineteenth century, it was hoped that with the rapid development of communications by land, sea and air, nations by being brought closer together would come to a better understanding of each other. In this, we have been sadly disillusioned. For all practical purposes, we may now say that distance has been annihilated. But physical contiguity has not brought about international amity, neighbourhood does not mean neighbourliness. Instead, we find the hostility among nations only the more intensified. Frequent contacts have produced irritations. There are at present more people who suffer from mental ulcers than there have ever been before. The tendency to a microscopic examination of the faults of other nations is nowadays more prevalent than a generous panoramic view of international relations. In China, England and elsewhere, there are many journalists and publicists who make it their business to indulge in constant recriminations against the nationals of other states. We strongly deprecate against such a practice. We believe that more good will come by concentrating on the good points we have in common with other countries than by harping on our differences. To do this is not easy. We have first of all to create a real desire for international goodwill. At the same time, we should also strive to bring about a friendly atmosphere, in which physical contiguity will not result in irritations, but in a genuine respect for each other's point of view. It is our firm conviction that the best way to do this is through cultural understanding. In the past, religious contacts between nations have invariably resulted in persecutions and massacres. Since the Renaissance, political contacts have turned history into a record of the scuffles of kites and crows. With modern industrialization, economic contacts have become the rule, and we know what they have meant in the past and what they will mean in the future, if we are not careful: they constitute the main cause of the Great War, and are at the back of the present dangerous urge towards economic nationalism. But we have never heard of cultural contacts which have resulted in anything but good. What we ought to do therefore is to emphasize this aspect of international relations. Culture traffics in ideas. It has no national boundaries, it enriches itself just as much by what it gives as by what it takes. In it, everybody can participate. A Hottentot can be as interesting in his cultural contributions as an average educated European. Culture has always maintained an Open Door policy. There is only one condition for entry—the humility to learn. Now, there is one activity of the League of Nations which has not been given the prominence it deserves—the work of the International Institute of Intellectual Co-operation. We think so much of the political and economic functions of the League, that we are apt to forget its cultural function, but it is a function which, we are sure, will increase in importance with time. No real political and economic understanding can exist, unless it is based upon a cultural understanding. Culture is of the spirit. And unless the spirit of co-operation and goodwill is present in all our international undertakings, our efforts in organizing for peace will be in vain. This being so, we should therefore bend all our energies to make this part of the League's work a reality. One way to do this is to set up in every country an institution, the principal object of which should be the promotion of international cultural understanding. Such an institution is the Sun Yat-sen Institute for the Advancement of Culture and Education, under whose auspices the T'ien Hsia Monthly is being published. 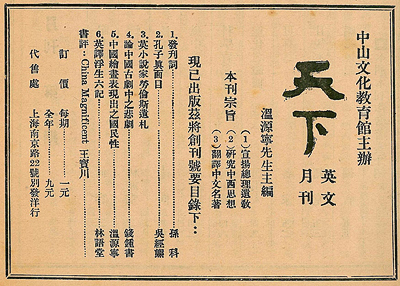 Being a Chinese-run organ, naturally the T'ien Hsia Monthly will attempt more at an interpretation of China to the West, than of the West to China. But as its name implies (T'ien Hsia=Universe), anything that is of vital interest to men and women all over the world comes within its scope. We welcome therefore contributions from Western scholars and others who are interested in ideas and who wish to bring about international cultural understanding. The only thing we rule out is current political controversies. Purely personal references will also be excluded from its pages. One of the favourite quotations of our late leader, Dr. Sun Yat-sen, is ‘T'ien Hsia Wei Kung' (The Universe is for everybody). We want to see this dream of over two thousand years ago realized to-day. The T'ien Hsia Monthly represents a modest effort towards this end. T'ien Hsia Monthly 1, no. 1 (August 1935): 3-5.